Description: Hearts break. Loved ones are lost. Life keeps moving. Thank you Liz for accepting this interview. It is a pleasure to have you here today.I have read a lot of great reviews about your book, I am eager to share with my followers a little bit more about you. RD- Welcome. Can you please tell us a bit about yourself? Liz – I am just writer from the Midwest. I am a pretty normal girl. I have two dogs, two cats, eight nieces and nephews, and often suffer from too few hours in a day. I love to travel and meet new, interesting people, books are my passion, horror movies are my favorite, and I am a trivia junkie. RD – Where did you get the inspiration or idea for Choices book? – How did the title of your book come about? 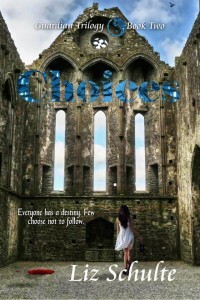 Liz – Choices is the second book in the Guardian Trilogy. When I was titling the books in the series I wanted the titles to represent what the books were about. The first book Secrets was about just that. This book is focused on the choices the characters make and how that influences/changes the Consequences (the last book). The original idea for the series came from a dream. I had this one crazy dream (which ended up in the book) and from that the world was born. RD – Which of your characters are the easiest and/or the most difficult to write about and why? Liz – Olivia is probably the easiest to write, but Holden isn’t hard to write either. I feel like I know them both so well now I can tell you how they would respond to any question or event that happens in my real life. Quintus was definitely the hardest one to write. I had to deal with his character on his own. If any other character was active in my mind, then it made it very hard to connect to Quintus. RD- How many hours a day do you devote to writing? Do you have a set routine or do you write when the mood strikes? Liz- I devote probably about 8-10 hours a day on some sort of writing activity. I don’t have a set routine, normally I am constantly trying to squeeze it in whenever the opportunity arises. RD – How long have your been writing? Was it a dream, a goal or is it just a hobby? Liz- I have been writing for a few years now. It start off as a goal and now it is a dream. Writing could never just be a hobby for me. RD – Do you listen to music or do you need a quiet place to write? 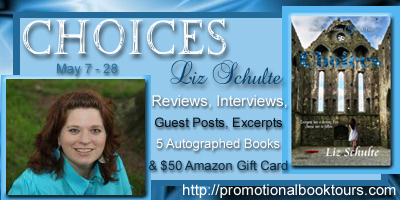 Liz – That depends on the story and the characters I am writing. Some demand quiet whereas others do well with music. Music always plays a role in my writing even if it is only to get me amped up for a scene. RD – What are you currently reading? Liz – I am currently reading The Woman in Black. RD- What is the next or current book/project you are working on? When can we expect it? Liz- The next project will be the completion on the series, Consequences. It will be out this fall. Thank you so much for having me on you blog today. Thank you Liz, all the best with your book – I have added your series to my reading pile!